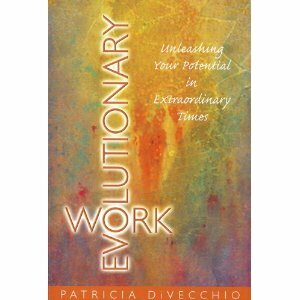 Evolutionary Work – Unleashing your potential in extraordinary times is meant to help people change how they view working in difficult economic times. Patricia starts off the book with a chapter that doesn’t seem to make sense when you first read it. She says “The times couldn’t be better.” What? Have you read the news reports on the global economy? What she means is that the entire planet is undergoing dramatic changes on almost every level. If we continue to work the way we have in the past then we will miss out on some new and exciting opportunities. Patricia believes that we all need to learn to adapt and change as necessary to get the most out of these changes that are happening. Her book is designed as more of a workbook on life. She leads you through exercises that will help everyone grow. Many people are afraid of what is going on in the world today. But as Patricia says you cannot have Love and Fear exist at the same time. You have to convert your fear into a useful ally. What happens if you don’t know what you fear? She will help you with that. This is a book that takes some time to get through. If you use it the way it’s meant to be used you will complete the exercises as you go through them and engage in a lot of self reflection. If you are really looking for a change in your work environment this book can help you open the doors and get started down a more fulfilling path.